The true story of a married pair of Holocaust survivors who survived by masquerading as Christians and working for the Underground. This book tells the individual stories of Amalie Petranker and Naftali (Norman) Salsitz, who survived the Holocaust by posing as Christians. While the book focuses on the war years, including the extraordinary way in which the couple met near the end of the war, it is also a study of the couple's courageous efforts to re-build their lives in America, where they raised a daughter and struggled to fit in. The war years are never far away in their hearts and minds, however. One of the central questions of the book is, How does one live a "normal" life after enduring so much terror and loss? A sub-plot of this nonfiction book is the evolution of the friendship that grew between writer and subjects during the course of creating the book. Despite being aware that a significant part of my ancestry is German Christian, they began to treat me like a daughter. To me, the fact that Norman and Amalie accepted me and grew attached to me is proof that they never lost their essential humanity, despite what was done to them and their families. “One of the most original and astonishing books yet about World War II and its aftermath.” – Norman R. Brokaw, Chairman of the Board, William Morris Talent and Literary Agency. "A moving story from eyewitnesses. An important memoir of the period." - Dr. Jan T. Gross, National Book Award Finalist for Neighbors: The Destruction of the Jewish Community in Jednabne, Poland. (Princeton University Press, 2001). 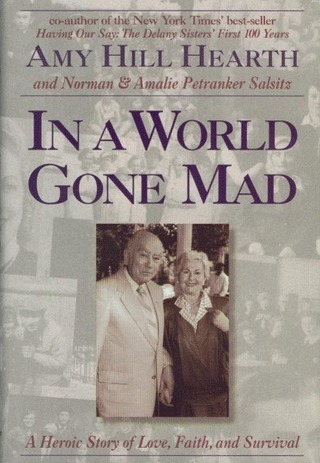 "Caught up in the evil of the Holocaust, Norman and Amalie Petranker Salsitz survive, move forward, but do not forget. Their story...touches us because it is a personal story." - Abraham H. Foxman, National Director, Anti-Defamation League.